Last year, the colour Marsala exploded on the wedding scene and popped up in everything from decor to bridesmaids gowns to florals. 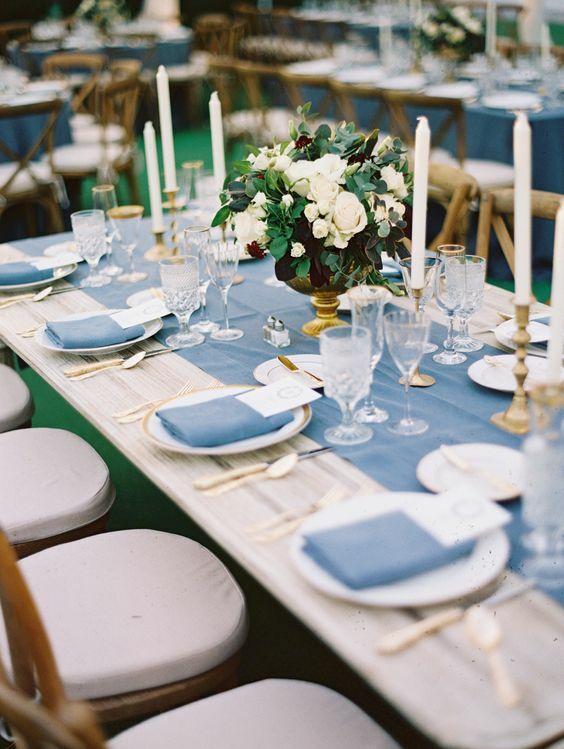 This year, the colour Slate Blue has quickly taken the wedding industry by storm. Today, on the blog, I thought I would feature the two colours together and the effects are beautiful! These colours look amazing mixed with a touch of gold in the accents. For this colour combo you could put the men in either grey or navy. Throwing in some pops of blush and creams make the colours pop that much more. We loved the dusty blue flowers with pops of other colours. 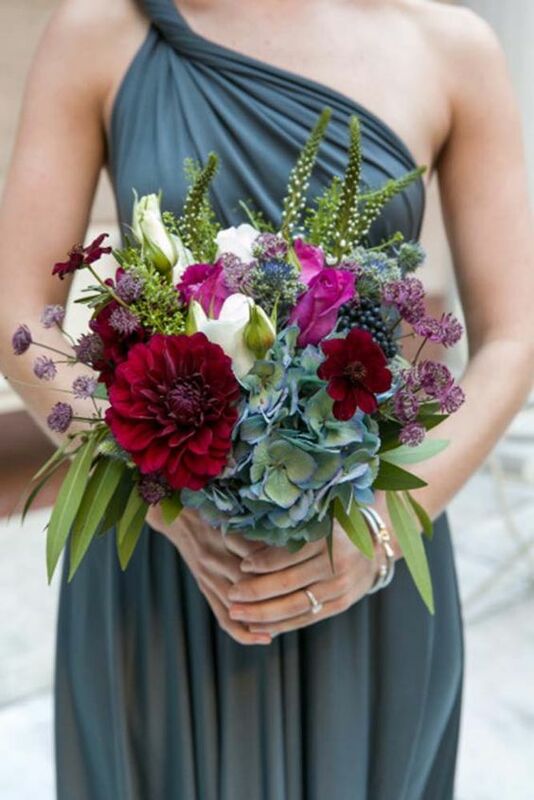 We are loving the trend of creating a bouquet that has multiple colours within it. This bouquet would also look amazing with your maids in the wine colour. 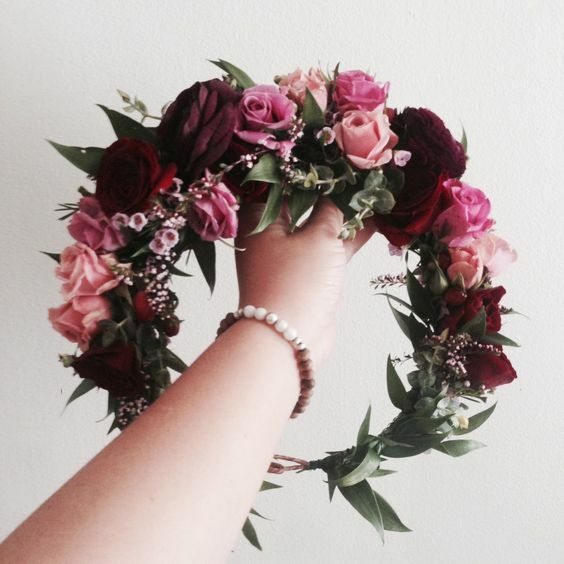 Who doesn't love a floral crown? They are such a fun way to incorporate your colours and achieve that Boho look. We matched this Slate Blue gown with some blush & burgundy florals that we had in the store. Such a beautiful look. This bouquet also has touches of lace in it as well. Another option would be to keep your bridal bouquet a bit simpler and do the girls with more accent colours. 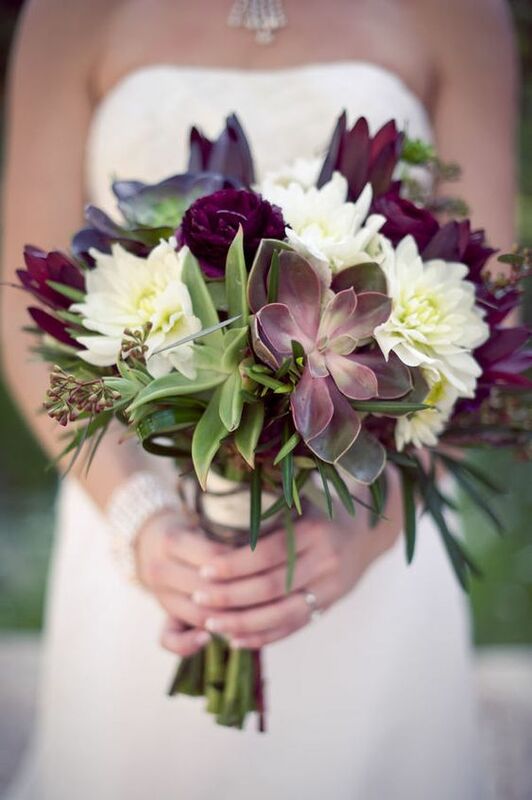 We love the pops of the darker burgundy mixed in with the softer shades. Against a white or ivory gown this bouquet would be stunning! We love this decor. It's a great reminder that less is sometimes more. I love that the main colour is the dusty blue and then there are some splashes of gold and subtle hints of burgundy in the flowers. I love the candles and that it's fancy without being too over the top. And of course, we couldn't do a theme without showcasing a gown from OUTW that we thought would fit in perfectly with this colour scheme. This is a new arrival for us and the back and train are equally as stunning. We adore the classic ivory with this colour to make the burgundy + slate blue be the focal point. Do you have a theme or colours picked yet for your wedding day? Tell us about it! Newer PostBridal Crawl | All The Details.